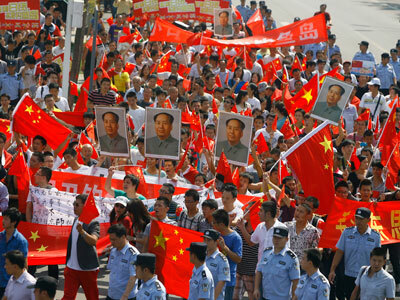 The 81st anniversary of Imperial Japan's invasion of China has sparked a fresh wave of anti-Japanese protests. Relations between the Asian nations deteriorated after Japanese activists landed on disputed islands in the midst of a territorial row. 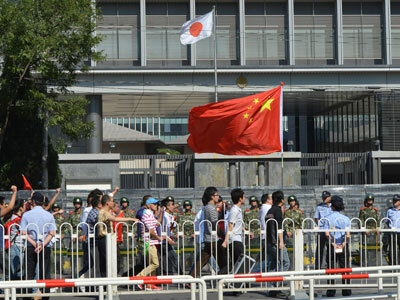 Thousands of angry protesters gathered outside the Japanese embassy in Beijing brandishing banners with patriotic slogans. 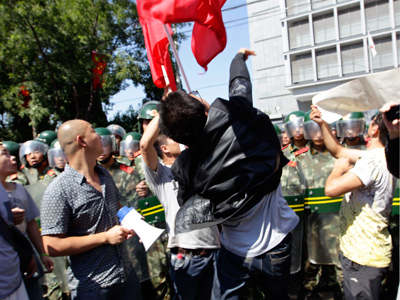 They threw water bottles and shouted anti-Japanese chants, reminiscent of wartime enmity between the two countries. Across China many Japanese businesses have been forced to close their doors in what is feared to be the worst day of anti-Japanese protests. The territorial dispute swiftly escalated after two Japanese activists landed on the island on Tuesday, sparking an immediate response from the Chinese government. 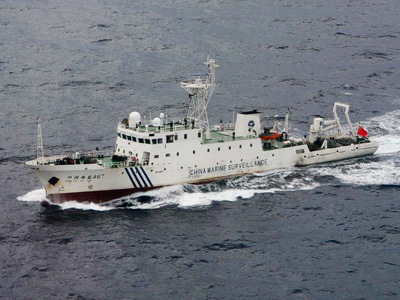 Following the stunt, eleven Chinese government vessels entered waters around the Diaoyu Islands — known in Japan as the Senkaku Islands – though none of them breached Japanese territorial waters. Both China and Japan lay claim to the small group of islands in the East China Sea. The archipelago is uninhabited, but it is believed to house significant oil and gas reserves and is located in an important shipping lane. 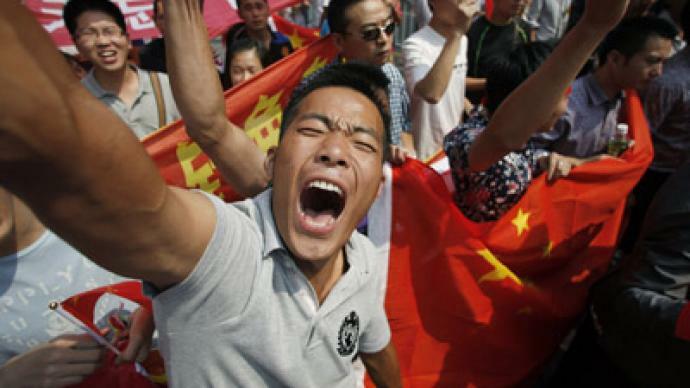 Protests erupted in China last Tuesday when the Japanese government announced it would purchase the islands from their private owner. Currently both nations have ships patrolling the area, giving rise to fears of a possible clash. 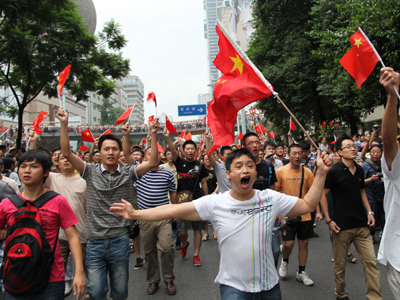 Additionally, there are reports from regional media of a flotilla of 1,000 Chinese fishing boat heading to the isles. Japan administered the islands for decades before WWII, but has had its claimant challenged by both China and Taiwan. US Secretary of Defense Leon Panetta was in Beijing on Tuesday to push for "calm and restraint on all sides" of the conflict. Panetta told his Chinese counterpart Liang Guanglie that Beijing should seek to strengthen its military ties with the US with a view to allaying a future conflict. "Our goal is to have the United States and China establish the most important bilateral relationship in the world, and the key to that is to establish a strong military-to-military relationship," said the Secretary of Defense. The US has previously criticized the Chinese government’s caginess regarding its rapidly growing military. Panetta also met with Japanese officials on Monday in Tokyo where he sealed a deal to construct a missile defense radar on Japanese territory. Following the meeting, Japanese Foreign Minister Koichiro Gemba said that it was “mutually understood” that the islands were included in the territory covered by the 1960s US-Japan security treaty. Cheng said the US was embarking on a “hedging strategy,” seeking closer ties with Japan with a view to facilitating its planned “come-back” to Asia. The US is benefiting from “the fear and resentment” on the part of Japan for China in order to extend its influence in the region, concluded Cheng.